San Francisco is a city known for its rolling hills and iconic architecture. One of the best ways of seeing this unique skyline is from the middle of the Bay on a San Francisco boat tour. Travelers heading to the infamous prison island in San Francisco make the mistake of thinking the boat to Alcatraz will be the same as San Francisco boat tours. They really are not one in the same. On Alcatraz day tours, the ferry simply shuttles people to the island and back to mainland. It’s only on the Alcatraz night tour will you enjoy a narrated boat tours around the island. Luckily, just about every San Francisco boat tour will include sailing past Alcatraz Island. In addition, most Bay cruises will cruise beneath the Golden Gate Bridge. And if you’re lucky, you’ll be able to see McCovey Cove — the famous cove behind the baseball stadium where the Giants play! Looking for boats rentals while you are in town instead of a tour? SF Bay Adventures can get you set up with a small boat rental in San Francisco. We are big fans of this sunset cruise of San Francisco — and it’s not just because all guests given two free drinks! Join an Adventure Cat San Francisco sailing tour to experience the Bay from a beautifully maintained catamaran. Sipping on wine and beer as the sun dips below the Golden Gate for a picturesque California sunset. These small group San Francisco boat tours depart from Pier 39. You’ll spend an hour and a half sailing around Alcatraz Island over to the Golden Bridge. Imbibe on beer and wine with light h’ors devours as you enjoy the sun dipping past the San Francisco skyline. Brunch in San Francisco could be considered a national past-time. San Francisco restaurant Mama’s is known for their typical two-three hour lines on Sunday. Which is on par with other well known brunch spots around town! One of the best kept secrets for avoiding lines at brunch time, is to hop aboard a San Francisco cruise that comes with a champagne brunch! Hornblower Cruises take place aboard the historic California Hornblower and are filled with good eats and even better views. As fun as their San Francisco dinner cruise can be, it sure does get chilly in the evenings. We find the weather to be much more welcoming during a San Francisco lunch cruise. Join the only wine tasting Golden Gate Bay cruise in the city for a unique way to see the San Francisco skyline. This San Francisco boat tour is paired with a flight of five wines nearby Sonoma & Napa in Wine Country. Even though there are a lot of ways of getting to Wine Country from San Francisco, Wine Tasting on the Bay can bring a little taste of Sonoma & Napa onto San Francisco boat tours. Spend an afternoon exploring Fisherman’s Wharf and then board your special special cruise for a complimentary wine tasting flight: either red or white. Along with the wine, you’ll enjoy a two hour narrated Bay cruise as travel beneath the Golden Gate Bridge, around Alcatraz and over to the Ferry Building. Set sail on the San Francisco Bay aboard a double-masted sailboat with the San Francisco Sailing Company. These San Francisco boat tours depart from Pier 39 and are within walking distance to some of the best hotels in Fisherman’s Wharf. All guests receive two complimentary drinks of beer or wine during this 90 minute excursion to the Golden Gate Bridge. Sail past the former maximum security penitentiary on Alcatraz Island and Angel Island — an immigration station once regarded as the Ellis Island of the West. Bay Voyager made it onto our countdown of the 25 best San Francisco tour — and for good reason! San Francisco boat tours with Bay Voyager are led on a rigid inflatable boat (RID) and the groups are always intimate, no more than 12 people. Over 90 minutes you will cruise past both the iconic Golden Gate Bridge and the San Francisco-Oakland Bay Bridge. The Bay Bridge might not be as internationally recognized as the Golden Gate, but it has been gaining notoriety for the nightly light show comprised of thousands of LED lights on the suspension cables. For nearly 50 years Cap’n Jacky has been leading San Francisco whale watching tours, sports fishing and San Francisco bay tours from iconic Fisherman’s Wharf. Cap’n Jacy is a part of a small, but still thriving, community of fishers that dock their boats at The Wharf. Travelers to San Francisco are surprised to learn there are actually still fishermen (or in Jacky’s case, fisherwomen?) at the Wharf. At least not until they stroll past the fishers in their boats trying to entice people walking around the Wharf to hop on board for a San Francisco boat tour! There is no booking online. No proof of purchase to bring to your tour. You simply call ahead or just show up to the docks on a busy day looking for her boat — The Wacky Jacky. Get up close to the sea lions at @pier39 when you take a Bay Cruise or Escape From The Rock Cruise! Tickets available at blueandgoldfleet.com! The ferry to Sausalito isn’t a San Francisco boat tour, per say. There won’t be any guided narration on this 30 minute trip. However, you will be able to enjoy scenic views of the Golden Gate Bridge, Alcatraz Island and the Bay Bridge on the short trip to Sausalito. This Blue & Gold Ferry is one of the most affordable ways of seeing the San Francisco skyline from the Bay and a scenic way of getting to Sausalito for lunch. If you can, try to time your return ferry to San Francisco for about 30 minutes before sunset for a DIY sunset San Francisco boat tour! Better yet, grab a San Francisco bike rental with Dylan’s Tours to bike the Golden Gate Bridge. Enjoy an afternoon in Sausalito and then catch this scenic ferry from Sausalito to San Francisco. Dylan’s Tours Bike Shop is only a few blocks away from the Pier 41 Ferry Terminal in Fisherman’s Wharf! Some of our girls at the dock ? Thanks @rotten_ralphs for the shot! ?? Another great budget option is a San Francisco boat tour with Red & White Fleet. You’ll cover more ground than with a commuter ferry. This 90 minute tour will take you along San Francisco’s shoreline from Golden Gate Bridge to the Bay Bridge. 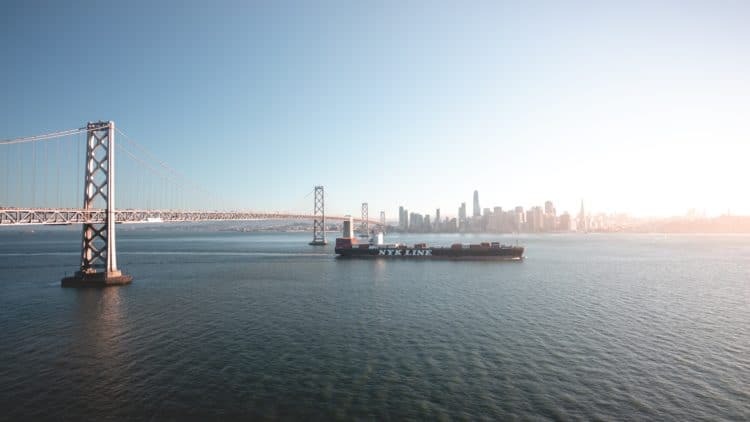 While traveling between the two bridges you’ll cruise past unparalleled views of the San Francisco skyline, Alcatraz Island and Treasure Island. Treasure Island is a manmade island, named after Mark Twain’s novel of the same name, built for the World’s Fair of 1939. This unique experience offers a competitive experience sailing the San Francisco Bay from the decks of a America’s World Cup Class racing yacht! If you are truly looking for a San Francisco Bay cruise adventure, look no further than ACsailing SF on Race Day. Ever wanted to a turn at the helm of a racing yacht? You’ll have a chance on this San Francisco boat tour if you’re adventerous enough! Otherwise, you can kick back back and relax watching the pros maneuver this mighty piece of engineering. It's May 1st… do you know what that means? The RocketBoat is back! ?? The most thrilling ride on the Bay is waiting for you! Check out the schedule and get your tickets now at blueandgoldfleet.com! San Francisco boat rides on the speedy RocketBoat are unlike any other boating experience on the Bay. This speedy 30 minute San Francisco boat tour makes big splash in such a short amount time. Fair warning: the RocketBoat is a wet zone! Luckily, panchos are available for your ride. Even though you won’t be visiting the Golden Gate Bridge, you will get an upclose look at the Bay Bridge and McCovey Cove where the Giants baseball team plays. Enjoy the iconic city skyline from the Bay on a San Francisco boat tour.